Family Ostraciidae- Trunkfishes, Cowfishes; puffers that don't (i.e. don't blow up); are encased in a hard dermal shell. None of the TWA trunkfishes are used as pets on a regular basis, and only should be attempted as young. The Honeycomb Cowfish, Lactophrys polygonia (3), Scrawled Cowfish, L. quadricornis (3), Smooth (L. triqueter) (3) and Spotted (L. bicaudalis) (3). Trunkfishes are all pretty enough when smaller (all get beyond a foot long), and are definitely curiousities in shape and intelligence, however these non-expansive puffers can release toxins into their water when disturbed, taking themselves and everybody with them to fishy Heaven. Ecotype: Reef bottoms when small, open sand and grass beds as adults. Lactophrys bicaudalis (Linnaeus 1758), the Spotted Trunkfish. Tropical west Atlantic. To nineteen inches. This one's about fourteen inches, in the Florida Aquarium, Tampa. More "spotty" appearing as juveniles. Lactophrys (now Acanthostracion) polygonius (Poey 1876), the Honeycomb Cowfish. Tropical west Atlantic. To about nineteen inches in length. Bahamas pix. Lactophrys (now Acanthostracion) quadricornis (Linnaeus 1758), the Scrawled Cowfish. A small one (four inches) and adult one in the Bahamas. Lactophrys trigonus (Linnaeus 1758), the Buffalo Cowfish. Tropical west Atlantic. To about eighteen inches in length. St. Thomas pic. Lactophrys trigueter (Linnaeus 1758), the Smooth Cowfish. Tropical west Atlantic. To about eighteen inches in length. A juvenile and adult (3" and 12" respectively), in Tobago. And a ten inch individual in the Bahamas. Family Tetraodontidae- puffers that blow up, smooth or with small prickles. Every now and then a few Sphoeroides genus puffers will be brought in; the Bandtail (S. spengleri) (3) and Checkered (S. testudineus) (3) Puffers are not good aquarium species. They bite; other fishes, invertebrates, and you. Ecotype: Shallows. Rubble, sand, sea grass beds with sand to dig in. Sphoeroides spengleri (Bloch 1785), the Bandtail Puffer. Central and western Atlantic. Brackish and marine. To seven inches long. This one about four inches, in Tobago. 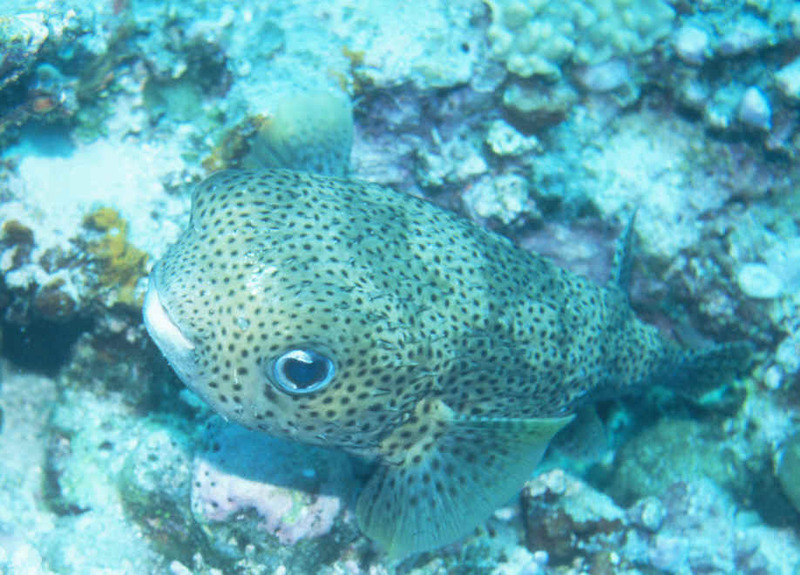 Sphoeroides testudineus (Linnaeus 1758), the Checkered Puffer. To a foot in length. Live in shallows, in seagrass beds. Burrow in sand to hide, ambush prey. St. Thomas pic. Subfamily Canthigastrinae. The Sharpnose Puffer, Canthigaster rostrata (1), like tobies from elsewhere, live and let live, except for the occasional invertebrate nibble. Ecotype: Reefs and sea grass beds. Canthigaster rostrata (Bloch 1786), simply called the Sharpnose Puffer. Tropical west Atlantic species, common and inexpensive. To five inches. Eats mainly seagrass (and some invertebrates) in the wild. Specimens below of a male and female in the Bahamas and Cozumel shown, and a male and female in Bonaire. Family Diodontidae- Burrfishes, Spiny puffers... that blow up with large spines. The Burrfishes of the genus Chilomycterus are utlized from time to time from the area though never in great quantities. Mostly you'll find the Striped Burrfish, C. schoepfi (2), but the Web (C. antillarum) (2), and even Bridled (C. antennatus) (2) are imported occasionally. Both circumtropical Diodon species occur in the TWA. The four-saddled non-spotted Balloonfish, D. holocanthus (1) and profusely spotted with no dorsal bars, the Porcupinefish, D. hystrix (2), are both fine for home aquariums when small. Chilomycterus antillarum Jordan & Rutter 1897, the Web Burrfish. Tropical western Atlantic. To only ten inches in length. Aquarium photos. Note, this genus' and Cyclichthys body spines are not retractable. Diodon holacanthus Linnaeus 1758, the Long-Spined Porcupinefish. Circumtropical in distribution. To some eighteen inches in length in the wild. Can be told apart from the similar D. liturosus by its longest spines being on top of its head. A comical, hardy addition to a fish-only rough and tumble marine system. Aquarium, St. Lucia (Caribbean) and Bonaire images. Diodon hystrix Linnaeus 1758, the Spotted Burrfish. Circumtropical in distribution. To some three feet in length in the wild (not a misprint). Here are photos of specimens in Hawai'i and the Maldives. A word about going to places in the TWA; GO. It's about next door if you live in the United States and many countries (and U.S. States) that make up the area are a travel bargain. Keep your eye out for inclusive (airfare, hotel, diving, meals'¦) deals as the season, local economies, and airline wars wax and wane each year. There are some sure bargains in most locales for those who are willing to research, and keep a flexible schedule. It's not for cost-savings alone that this part of the world is the most intensely visited and dived. There is the zenith in accommodations for all level of aquatic interest in the Tropical West Atlantic, from casual shore diving to luxurious live-aboards. Check it out on the Internet and travel services, and do more than just "keep fish". Go visit them in their native digs. Diving and Snorkeling Guide To (various titles): The Bahamas, Virgin Islands, Cozumel, The Cayman Islands, Florida Keys, Bonaire and Curacao. Pisces Books, NY. for the Successful Saltwater Aquarist. Microcosm, VT. 432pp. Hoff, Frank. 1987,8. Coral reefs of Florida, pts. 1-3 (The environment, Algae, Fishes. Humann, Paul. 1996. Reef Fish Identification; Florida, Caribbean, Bahamas, 2d ed. Revised. New World Publications, Inc., FL. 396pp. Michael, Scott W. 1998. Creating Caribbean habitats in your tank. AFM 11/98. Michael, Scott W. 1998. Biotopes for the marine aquarium; The Caribbean. AFM 12/98. Michael, Scott W. 1998. Reef Fishes, v.1. Microcosm, VT. 624pp. Nelson, Joseph S. 1994. Fishes of the World, 3d ed. John Wiley & Sons, Inc. NY. 600pp. Randall, John E. 1996. Caribbean Reef Fishes, 3d ed. T.F.H. Publications, Inc. NJ. 368pp. Edmonds, Les. 1989. The nurse shark and its suitability in captivity. TFH 5/89. Fenner, Robert . 1996. Shark attack. TFH 5/96. Michael, Scott. 1995. Nurse sharks; Not as good an idea as it might seem. AFM 1/95. Esterbauer, Hans. 1994. The ecology and behavior of moray eels. TFH 2/94. Fenner, Robert. 1995. Morays; the family Muraenidae. TFH 3/95. Michael, Scott A. 1995. Frogfishes: anglers of the reef & The frogfishes: species in the marine trade. AFM 11,12/95. Pietsch, Theodore W. & David B. Grobecker. 1985. Frogfishes: aggressive mimics of the reef. FAMA 4/85. Krechmer, Michael. 1993. Trumpetfishes: aquarium oddities. TFH 3/93. Stratton, Richard F. 1994. Trumpetfishes: definitely different. TFH 12/94. Fenner, Robert. 1998. Pipes, horses and dragons; a real challenge. TFH 5/98. Giwojna, Pete. 1996. Seahorse nutrition, pt.s I-V. FAMA 10/96-2/97. Scarratt, Alison M. 1996. Techniques for raising Lined Seahorses (Hippocampus erectus). Aquarium Frontiers 3:1, 1996. Strawn, Kirk. 1959. Life history of the Pigmy Seahorse, Hippocampus zosterae Jordan and Gilbert, at Cedar Key, Florida. TFH 10/59. Vincent, Amanda. 1994. The improbable seahorse. National Geographic. 10/94. DeGiorgis, Joseph A. 1987. The longspined squirrelfish, Holocentrus rufus. FAMA 2/87. Fenner, Robert. 1996. An introduction to squirrelfishes. TFH 6/96. Michael, Scott W. The soldierfishes; fishes of the night. AFM 11/97. Michael, Scott W. The squirrelfishes; can you say "red"? AFM 12/97. Fenner, Bob. 1995. A diversity of aquatic life: The family Serranidae. FAMA 5/95. Fenner, Bob. 1995. A diversity of aquatic life: Creolefishes, Paranthias. FAMA 8/95. Fenner, Robert. 1996. Basses, groupers or hinds, the genus Cephalopholis. TFH 12/96. Hemdal, Jay. 1985. Caribbean basslets. TFH 12/85. Hunziker, Ray. 1995. Lovely Liopropoma. TFH 7/95. Michael, Scott W. 1995. Basses and grammas- you can't go wrong with these. AFM 8/95. Michael, Scott. 1996. The dwarf seabasses; put a little grouper in your tank. AFM 11/96. Michael, Scott W. 1998. Gorgeous groupers; one genus really does stand out (Cephalopholis). AFM 1/98. Murphy, Geri. 1992. The Caribbean Coney; a common fish of uncommon colors. Skin Diver, 5/92. Fenner, Robert 1997. Lionfishes; hear them roar. TFH 5/97. Michael, Scott W. 1996. Scorpionfishes- ambushers of the reef. AFM 5/96. Michael, Scott W. 1996. Scorpionfishes- many to choose from. AFM 6/96. Fenner, Bob & Cindi Camp. 1990. Diversity of aquatic life: the hawkfishes, Apogonidae. FAMA 4/90. Michael, Scott W. 1998. Hawkfishes; small, aggressive predators of the coral reef. AFM 8/98. Donovan, Paul. 1997. Remoras: traveling companions. TFH 3/97. Hemdal, Jay. The remora (Echeneis naucrates). FAMA 11/85. Fenner, Robert. 1997. Put a tiger in your tank; keeping snappers. TFH 2/97. Hemdal, Jay. 1989. High hats. TFH 5/89. Michael, Scott W. 1997. The goatfishes; put a goat in your tank! AFM 1/97. Fenner, Robert. 1997. The chubs called rudderfishes. TFH 8/97. Fenner, Bob. 1998. Going batty! Bats but not spades. TFH 3/98. Quinn, John R. 1989. A little bit of sole; flatfishes in the marine aquarium. TFH 11/89. Butterflyfishes. Odyssey Publishing/Tropical Reef Research, Aust. 250pp. Fenner, Bob. 1990. Diversity of aquatic life series: Queen angel, Holacanthus ciliaris. FAMA 5/90. Fenner, Robert. 1996. The French angelfish, Pomacanthus paru. TFH 4/96. Fenner, Robert. 1998. Perfect little angels. TFH 4/98. McKenna, Scott. 1988. Keeping the rock beauty angel. TFH 7/88. Michael, Scott W. 1996. Pygmy angelfishes; diminutive, but beautiful. AFM 1/96. Michael, Scott W. 1997. Angels of the reef; meet the genus Pomacanthus. AFM 9/97. Michael, Scott W. 1997. Holacanthus angelfish; their behavior isn't very angelic. AFM 10/97. Miller, Gary. 1986. Angelfish of the Caribbean. FAMA 8/86. Miller, Gary. 1986. Butterflyfish of the Caribbean. FAMA 9/86. Moe, Martin A. 1997. Spawning and rearing the large angelfish, Pomacanthus sp..
Aquarium Frontiers May/June, 97, 4(3). skilled in the marine hobby, angels are a challenge worth taking on. AFM 8/90. Stratton, Richard F. 1989. The queen angel. TFH 6/89. Allen, Gerald R. 1991. Damselfishes of the World. MERGUS, Germany. 271pp. Fenner, Robert. 1995. Jumbo damsels; advice for the conscientious aquarist. TFH 1/95. Hemdal, Jay. 1985. Pomacentrids of the Atlantic. FAMA 4/85. Thresher, Ronald. 1975. Atlantic Chromis. Marine Aquarist 6:8, 1975. Fenner, Robert. 1996. The wrasses we call hogfishes. TFH 10/96. Fenner, Robert. 1997. The razorfish, family Labridae. SeaScope v.14, Fall 97. Michael, Scott W. 1997. Beautiful wrasses; the unique species of the genus Halichoeres. AFM 3/97. Michael, Scott W. 1997. Hogfish; a mysterious common name. AFM 5/97. Michael, Scott W. 1998. Wrasses; the good, the bad and lovely. AFM 6/98. Atlantic Ocean. Copeia 1965, v.4, pp. 487-501. Stratton, Richard F. 1993. The Spanish hogfish. TFH 4/93. Thresher, Ronald. 1977. Caribbean wrasses. Marine Aquarist 8:2, 1997. Weingarten, Robert A. 1991. Sexual/reproductive patterns in Caribbean wrasses (Labridae). FAMA 12/91. Burgess, Warren E. 1981-82. Parrots of the sea. Pts I,II. TFH 12/81, 1/82. Fenner, Robert. 1996. Parrotfish pitfalls. TFH 1/96. Spies, Gunther. 1990. Sand factories- the parrotfishes. TFH 4/90. Fenner, Robert. 1996. Jawfishes. TFH 8/96. Kerstitch, Alex. 1988. Master builders. SeaScope, v.5, Winter 88. Noyes, John C. 1987. The dusky jawfish, Opistognathus whitehursti. FAMA 8/87. Stratton, Richard F. 1993. The yellowhead jawfish. TFH 3/93. Flood, Andrew Colin. 1997. The trouble with triggers. 2/97. Michael, Scott W. 1997. Triggerfishes; a great reason for having a saltwater tank. AFM 2/97. Stratton, Richard F. 1988. The queen of the seas. TFH 8/88. Fenner, Bob 1995. A diversity of aquatic life: filefishes, the Monacanthidae. FAMA 7/95. Quinn, John R. 1990. Fooling around with filefish. TFH 10/90. Fong, Jack. 1994. The ten most amusing boxfishes. TFH 9/94. Michael, Scott W. 1995. Get to know the tobies (sharpnose puffers). AFM 10/95. Michael, Scott. 1998. Swimming boxes; boxfish are interesting to keep, but choose their tankmates carefully to avoid disaster. AFM 3/98. Quinn, John R. 1986. Puffers and friends; a look at the pros and cons of keeping the popular puffers. TFH 5/86.